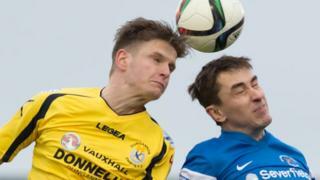 Gary Liggett salvages a point for Dungannon as his late goal earns them a 1-1 draw away to Ballinamallard United. James McKenna had given the hosts hope of a first win in nine league fixtures but Liggett's header keeps the Swifts one behind 10th-placed Ballinamallard in the Premiership table. Dungannon's Andrew Burns was sent-off in stoppage-time when a foul earned him his second yellow card of the match.